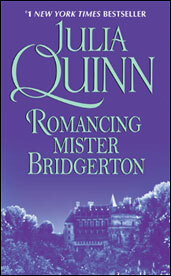 But Colin has a secret, too, and when he returns to London from his latest bout of wanderlust, he finds the once-plain Penelope the girl of his dreams. It is April, the start of The Season, and Lady Whisteldown, gossip columnist, is having a resounding success in keeping the ton apprised of the latest gossip. When raucous Lady Danbury offers a bounty of a thousand pounds to unmask the gossipmonger, Penelope's life veers out of control. It's a 4, and part of a delightful series which includes two Lady Whistledown novellas. Great summer reading!